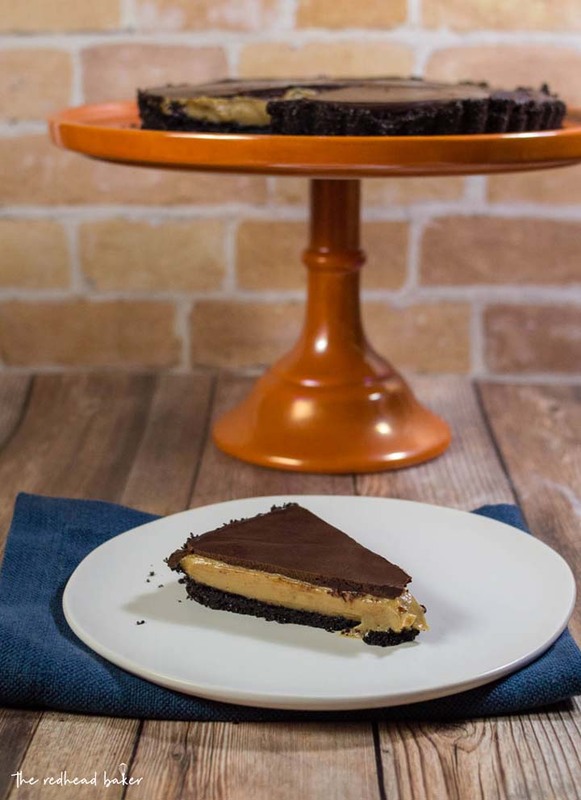 This decadent chocolate peanut butter tart has a sweet chocolate crust, a custardy peanut butter filling, and a rich chocolate glaze. It uses just a few ingredients, and requires almost no baking! Happy Pi(e) Day! 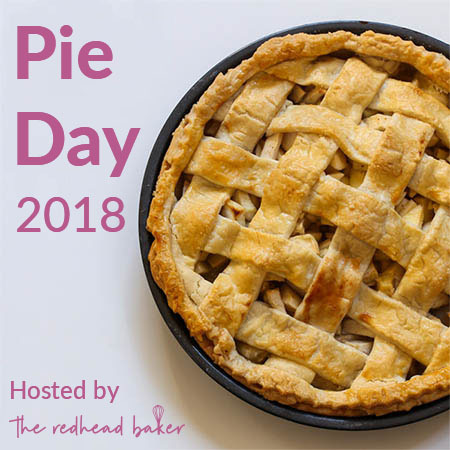 In honor of 3.14, a group of bloggers got together with me to post some pie recipes. 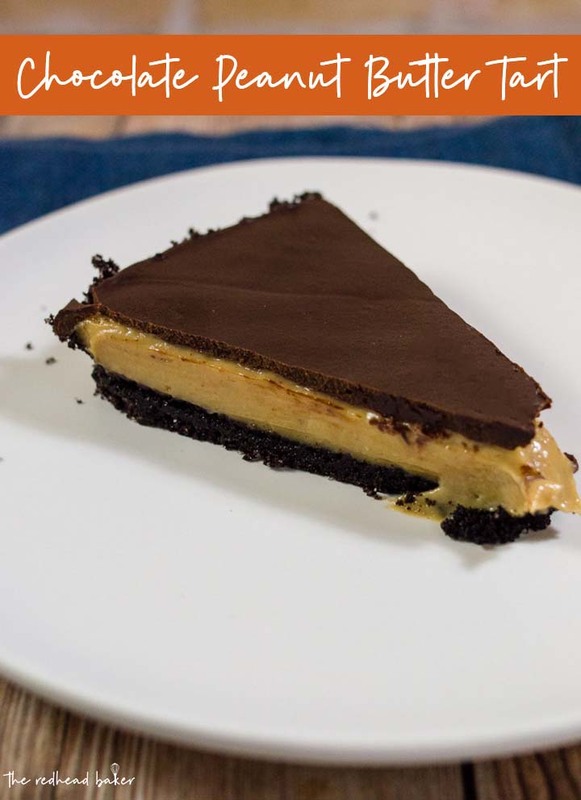 Once you’re done checking out this chocolate peanut butter tart, there are links to more pie recipes at the bottom of the post. OK, yes, I made a tart, not a pie. There isn’t too much difference. Pies have sloped sides, tart sides are straight up-and-down. Pie crusts are usually tender and flaky, while tart crusts are firm and crumbly. But they are close enough that I hope you’ll forgive me. I made this peanut butter tart for Thanksgiving dessert last year, and I’ve been thinking about it ever since. This tart is like a giant peanut butter cup. Chocolate crust, peanut butter filling, and a chocolate glaze on top. The crust is the only portion that requires baking. I used Nabisco Famous Chocolate Wafers (about 25 of them) to make my crust. My local grocery store doesn’t always have them in stock, so if you can’t find them at yours, you can use Oreos (15 of them, twist them apart and scrape out the filling), or chocolate graham cracker sheets (12 of them). 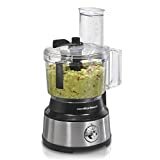 I use a food processor to crush the cookies to fine crumbs. If you don’t have one, or don’t want the bother of dragging it out, you can put the cookies in a heavy-duty zip top bag and go to town on them with a rolling pin. Very cathartic, if you need to get some anger or stress out. It can cause scaredy-dogs to run and hide in the closet, though. Not that I know from experience. The filling is a cooked custard, similar to an ice cream base, but thicker. I don’t recommend using natural peanut butter in this custard. I don’t quite understand the science, but I attempted this custard with natural peanut butter first, and it didn’t come thicken properly. It does work with regular peanut butter, though. A ganache is a simple mixture of cream and chocolate, but it adds richness and elegance to anything you pour it over. You may think that just 4 ounces of chocolate and a quarter cup of cream isn’t enough, but you don’t want the glaze to be too thick. This makes just enough ganache to lightly glaze the peanut butter custard, barely reaching the edges of the tart. 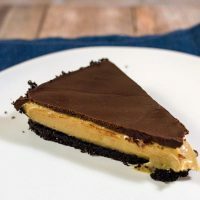 This peanut butter tart is just the right blend of down-home, comfort dessert with a touch of elegance for an upscale meal. Anyone who loves the combination of chocolate and peanut butter will love this dessert. Position a rack in the center of the oven and heat the oven to 350°F. Have ready an ungreased 9-1/2-inch fluted tart pan with a removable bottom. Bake the crust until it smells nutty and fragrant (crusts made with lighter-colored cookies will brown slightly), about 10 min. Set the baked crust on a rack and let cool. The crust can be made up to one day ahead of filling, and stored at room temperature, wrapped well in plastic. In a medium saucepan, bring the milk and salt to a simmer over medium heat, stirring occasionally. Meanwhile, in a small bowl, whisk the egg yolks, brown sugar, and flour until well blended. Slowly add the hot milk, whisking constantly. Pour the mixture back into the saucepan. Cook over medium heat, whisking constantly, until it thickens and comes to a full boil, about 3 min. Continue to cook, whisking constantly, for 1 min. Remove the pan from the heat and add the peanut butter and vanilla; whisk until well blended. 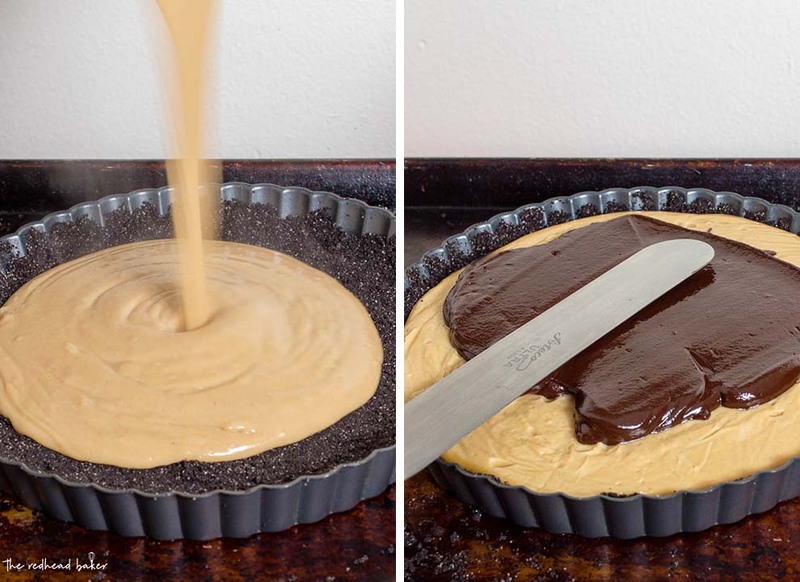 Pour the hot peanut butter mixture into the crust and spread evenly with a rubber or offset spatula. Gently press a piece of plastic wrap directly on the filling’s surface to prevent a skin from forming. Refrigerate the tart until cold, about 2 hours, before proceeding with the recipe. Place the cream in a heavy-bottomed saucepan. Heat over medium heat just until scalding. Pour the hot cream over the chocolate and let stand for 1 minute, then stir until smooth. Pour the glaze over the peanut butter filling. Refrigerate until the glaze is set. Keep chilled until ready to serve. Disclaimer: nutrition information is an estimate only. For complete nutrition information, please consult a registered dietitian. Oooh, this needs to go on our dessert rotation ASAP! The peanut butter chocolate combo cannot be beat! Thanks for organizing this fun Pi Day event, Coleen!!! I love the sound of that, especially with that oozing PB custard filling. Yum! Thanks for hosting today’s pie fun. 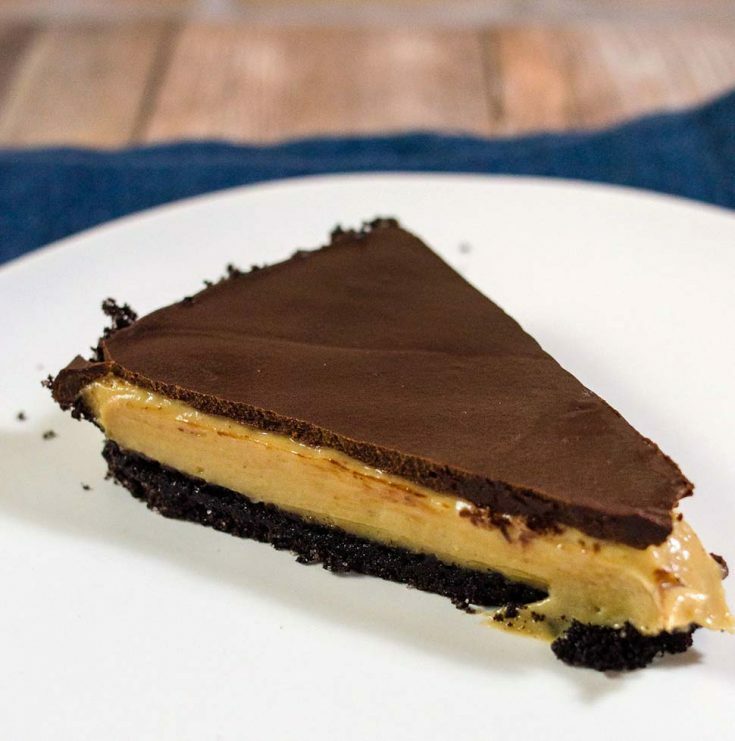 A giant peanut butter cup….well YES PLEASE! The texture of that tart is calling my name! What a stunning table display it will be at Easter this year! I’m pretty sure I’ve made this recipe before – if I’m right, it’s soooo good. Need to make it again. Wonderfully rich. We are suckers for chocolate and peanut butter. This is going to be a hit at our house! 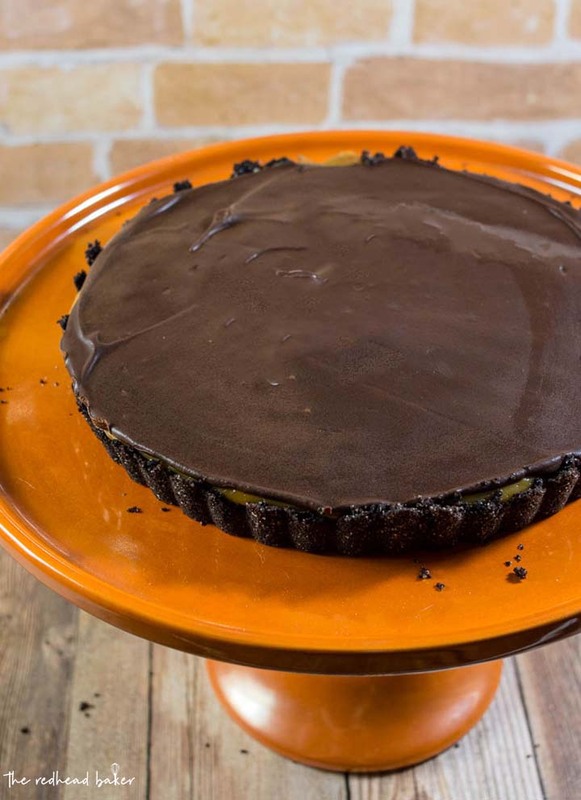 Did someone say “giant peanut butter cup?” This tart is gorgeous. I need it in my life. Oh my goodness! This sounds amazing! And it’s gorgeous!